That's what PA State Rep. Adam Ravenstahl called what he sent to Pittsburgh City Council for his gig at the Allegheny County Sanitary Authority board (cover letter and larger version can be seen @ The Pittsburgh Comet). You'd think after all the charges of nepotism and unethical behavior over this appointment he'd at least try. 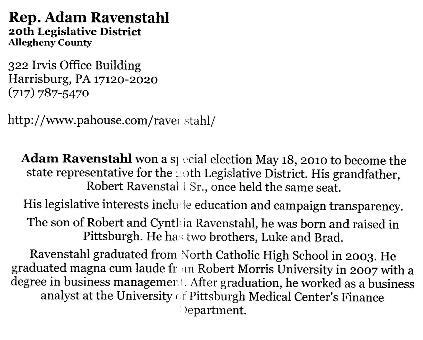 Though to give Adam his due, it does contain way more personal information than his campaign flyers did. And, he's also probably taking political advice from his roomie and big bro Lil Mayor Luke, who undoubtedly told him if he gave an inch they'd be asking about his socks and underwear next. Stand strong, Lil Rep. Adam!